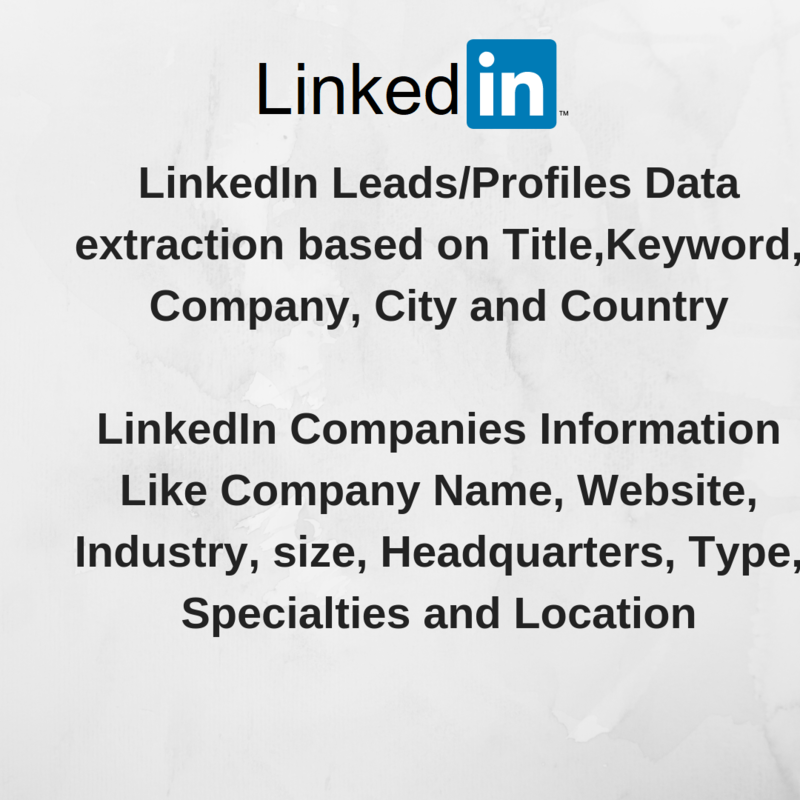 I am working on LinkedIn from last 7 years and have completed lots of data extractions task for many companies employees/leads to help them for Analysis and increase their Business. Already have delivered Millions People Data with Buyers Sanctification on Many Freelancing Sites. Following Fields can be included on custom request and need extra time and money. Delivering Following fields for Companies Profiles Pages on Custom request and needs extra time/price. 1) Samples from Previous jobs can show based on demand. 3) I have LinkedIn Premium, Business, Sales Navigator, Recruiter Lite paid memberships Accounts to Deliver results quickly with millions of records. 1- Data can be delivered in Excel/Csv format. 2- For customized Orders like more fields additions Please contact for pricing/time. 4- Delivery and Response time is within 24 hours. Normally I do in 12 hrs but on Safe side 24 hrs. 5. 100% Money Guarantee and buyer satisfaction. You need to provide input like for which Company Name or keyword, position, Country or area you are looking leads. I have worked on lots of LinkedIn Scrapping projects related to profiles Data extraction in very details Portfolios are attached. LinkedIn Scrapping and Web Data extraction Directories Is My passion. I believe when you work first time with me. We definitely will be working for long time. I always Love to work with clients Discussing Budgets and Time suitability. Please do not Hesitate to contact and share details. Many of Website(s) I have worked are listed below. 1)	LinkedIn Profile(s) data extraction which contains Person Info Name, Location, Jobs History. Education History, Recommendations History and lots more. It helps Companies to find right people for Hiring and get there needs done. 2)	Instagram comments(s) scrapper and Tags collector to increase market and Business.